BACKGROUND AND PURPOSE: Although the term posterior reversible encephalopathy syndrome (PRES) was popularized because of the typical presence of vasogenic edema in the parietal and occipital lobes, other regions of the brain are also frequently affected. We evaluated lesion distribution with CT and MR in a large cohort of patients who experienced PRES to comprehensively assess the imaging patterns identified. MATERIALS AND METHODS: The locations of the PRES lesion at toxicity were comprehensively identified and tabulated in 136 patients by CT (22 patients) and MR (114 patients) imaging including the hemispheric, basal ganglial, and infratentorial locations. Clinical associations along with presentation at toxicity including blood pressure were assessed. RESULTS: Vasogenic edema was consistently present in the parietal or occipital regions (98%), but other locations were common including the frontal lobes (68%), inferior temporal lobes (40%), and cerebellar hemispheres (30%). Involvement of the basal ganglia (14%), brain stem (13%), and deep white matter (18%) including the splenium (10%) was not rare. Three major patterns of PRES were noted: the holohemispheric watershed (23%), superior frontal sulcal (27%), and dominant parietal-occipital (22%), with additional common partial or asymmetric expression of these primary PRES patterns (28%). CONCLUSION: Involvement of the frontal lobe, temporal lobe, and cerebellar hemispheres is common in PRES, along with the occasional presence of lesions in the brain stem, basal ganglia, deep white matter, and splenium. Three primary PRES patterns are noted in the cerebral hemispheres, along with frequent partial or asymmetric expression of these PRES patterns. Awareness of these patterns and variations is important to recognize PRES neurotoxicity more accurately when present. Posterior reversible encephalopathy syndrome (PRES) is most commonly identified in patients with eclampsia and in those who have undergone organ transplantation (possibly related to cyclosporine or tacrolimus [FK-506].1–9 PRES has also been reported in patients with other systemic conditions such as Wegener granulomatosis, systemic lupus erythematosus (SLE), nonspecific renal inflammatory conditions (glomerulonephritis, hepatorenal syndrome), hypertension, and postchemotherapy.10–17 Patients typically experience a combination of headache, altered mentation, visual disturbance, severe hypertension, and generalized seizures. Although the parietal and occipital lobes are most commonly involved, other lesion locations have been reported or demonstrated in the literature including the frontal lobes, basal ganglia, and brain stem. In this study, we retrospectively evaluated the lesion distribution and imaging features in a large cohort of patients with PRES to comprehensively assess for consistency of the typical PRES imaging pattern. We searched the radiology report data base for January 1998 to August 2006 for any patients in whom PRES or posterior reversible encephalopathy was cited on brain MR imaging. We performed additional similar searches in the data base for other conditions known to develop the PRES imaging pattern14–17 or that were associated with PRES, such as cyclosporine neurotoxic syndrome, tacrolimus/FK-506 neurotoxic syndrome, SLE, Wegener granulomatosis, scleroderma (systemic sclerosis), hypertensive encephalopathy, preeclampsia, and eclampsia. Brain MR imaging along with CT imaging studies were reviewed in the identified patients for features consistent with the characteristics of cyclosporine/FK-506 neurotoxic syndrome, eclampsia, or PRES. Cases were included by consensus agreement between 2 experienced neuroradiologists. Patients with clinical neurotoxic reactions and imaging features consistent with PRES were tabulated and combined with the PRES neurotoxicity data base of one of the authors (January 1991-June 2002), and the result of these 2 data bases was pooled. The pooled data represented patients originating from or referred to a tertiary care university regional medical center and associated hospitals with long-standing focus on solid organ transplantation (SOT), obstetrics, rheumatology, and oncology. In addition, the data also represented patients who were referred to a local tertiary care academic hospital with long-standing focus on bone marrow transplantation (BMT). The combined data represented the spectrum of patients with PRES neurotoxic reactions for this report. We obtained approval from the Institutional Review Board for this retrospective study. Criteria for confirmation of PRES included complete or partial expression of the typical PRES pattern, reversibility on follow-up imaging, vasogenic edema as demonstrated by MR diffusion imaging, and a presentation consistent with clinical neurotoxic syndrome. One hundred and thirty-six patients were identified who had significant clinical neurotoxicity and brain imaging features consistent with the previous description in the literature of cyclosporin A or FK-506 neurotoxic syndrome, eclampsia, or PRES. We reviewed the clinical inpatient and outpatient records of these patients. We paid specific attention to identifying clinical features leading up to and surrounding the development of PRES, along with known associations including cyclosporine or FK-506 neurotoxic syndrome and eclampsia. When more than 1 clinical association was present, the clinically dominant association was used for tabulation. Baseline and toxicity blood pressures were sought, and mean arterial pressure (MAP, 2/3 diastolic pressure +1/3 systolic pressure) was calculated at toxicity. Blood pressure was graded at toxicity as 1) normal (patient baseline, MAP ≤ 105 mm Hg), 2) slightly elevated (MAP 106–115 mm Hg), and 3) significant hypertension (MAP ≥ 116 mm Hg). We obtained MR imaging at toxicity in 114 patients. MR was the sole imaging technique obtained in 47 patients. After initial screening, CT imaging was obtained in 67 patients. CT was the sole imaging study obtained at toxicity in 22 patients. CT studies were obtained with 5-mm section thickness through the posterior fossa along with 5- to 10-mm section thickness through the supratentorial hemispheres. When used, contrast material consisted of intravenous 150 mL iothalamate meglumine (Conray 60; Mallinckrodt Medical, St Louis, Mo) or iohexol 300 (GE Healthcare, Milwaukee, Wis). MR imaging was performed at 1.5T and included sagittal and axial T1-weighted images (600 msec/min/1 [TR/TE/NEX]) with 5-mm section thickness and spin-echo or fast spin-echo axial proton density (2000-2500/min/5mm/1 [TR/TE/section/NEX]) and T2-weighted images (2500-3000/84-102ef/5mm/1 [TR/TE/section/NEX]). Contrast-enhanced T1-weighted images were obtained with 0.1 mmol/kg gadolinium dimeglumine (Magnevist; Berlex Laboratories, Wayne, NJ) or gadopentatate (ProHance; Braco Diagnostics, Princeton, NJ) using typical T1-weighted parameters as described above. Fluid-attenuated inversion-recovery (FLAIR) images (9000-10000 msec/149 msec/2202 msec [TR/TE/TI]) and diffusion-weighted imaging (single-shot echoplanar, 10000 msec/min/5 mm/128 [TR/TE/section/matrix]) sequences were also available in most patients. The scope of the imaging features seen in cyclosporine or FK-506 neurotoxic syndrome, eclampsia, and the PRES imaging appearance has been described previously.1–17 Two experienced neuroradiologists assessed the imaging studies, and they itemized and tabulated the locations of imaging abnormalities (vasogenic edema, restricted diffusion, enhancement) by consensus agreement. Specific regions were tabulated separately including the frontal lobe, parietal region, occipital lobe, temporal lobe, cerebellum, brain stem, basal ganglia, and deep white matter (ie, external or internal capsule, corona radiata) with features characterized as patchy, confluent, or linear. Lesion enhancement, hemorrhage, and evidence of restricted diffusion were itemized and tabulated. In the 67 patients with both CT and MR imaging at toxicity, the initial CT studies were assessed for the presence or absence of cerebral hemispheric imaging findings consistent with PRES. The CT imaging studies were typically obtained on the day of the neurologic presentation at toxicity (headache, altered mentation, visual change, seizure). MR imaging was obtained at the following times: 1) 2 or more days after the initial neurologic event (19 patients), 2) 1 day after toxicity (26 patients), or 3) on the same day as CT and the neurotoxic event (22 patients; time difference, 1–20 hours; average, 6.6 hours). The initial CT studies were evaluated and graded by consensus as either 1) normal, 2) nonspecific imaging features, or 3) hemispheric imaging features consistent with PRES. These results were tabulated. In addition, identification of lesions in the brain stem, basal ganglia, and cerebellum were compared between CT and MR imaging. Ninety-three (68.4%) patients were female and 43 (31.6%) were male, with an average age of 42.4 years (range, 17–79 years). Five major clinical subgroups of conditions were recognized in 129 (94.8%) of these 136 patients: 1) postinfection, sepsis, or shock associated with multiple organ dysfunction; 2) posttransplantation (cyclosporine or FK-506) neurotoxic syndrome; 3) postchemotherapy; 4) autoimmune diseases; and 5) eclampsia. In 11 of 33 patients classified as having infection, sepsis, or shock, additional associations were also noted: recent cancer chemotherapy (5 patients), autoimmune disease with recent chemotherapy (2 patients), SLE (1 patient), and sickle cell disease with crisis (3 patients). In the patients classified as having an autoimmune disease, 5 had only a single definable condition: SLE (2 patients), scleroderma (1 patient), Wegener granulomatosis (1 patient), and Raynaud phenomenon (1 patient). In 7 patients with autoimmune disease, a second potential association with PRES was noted to include SLE with recent cyclophosphamide treatment (3 patients), Graves disease with thrombotic thrombocytopenia purpura (1 patient), psoriasis with recent treatment with cyclosporine (1 patient), polyarteritis nodosa with recent Epstein-Barr virus infection (1 patient), and nonspecific autoimmune syndrome with recent viral illness (1 patient). All patients who had undergone organ transplantation were on cyclosporine or FK-506 immunosuppression at toxicity. Patients with allogeneic BMT had also received marrow ablative or non-marrow ablative conditioning (high-dose chemotherapy or chemotherapy with total body irradiation) before transplant. In 13 of 26 patients with SOT, significant infection was also present at the time of the toxic event. No specific cause or consistent clinical “association” was found in 7 (5.2%) patients. In 4 of these patients, PRES developed in the face of increasing or acute hypertension, either in isolation (chronic drug use, prior renal cell carcinoma) or in association with chronic renal disease (nephrosclerosis, chronic renal failure, and dialysis). In 1 patient, PRES occurred unexpectedly 7 days after a Whipple procedure with an acutely elevated white blood cell count and significant hypertension. In 2 patients with known but unchanged chronic hypertension, no specific cause was identified. Among the 136 patients, headache, change in vision, altered mental status, nausea, or aphasia (alone or in combination) was the presenting symptom in 39 (29%) and seizure (frequently accompanied or proceeded by headache or change in vision) in 97 (71%). Blood pressure was normal (patient baseline) at presentation in 45 patients and slightly elevated in 17; significant hypertension was present in 74 patients. Lesion distribution and typical imaging characteristics in the 136 patients with PRES are reviewed in Table 1 and Figs 1–5. Focal or confluent vasogenic edema was present in the classic “posterior” parietal or occipital lobe region most consistently (134/136 patients) with additional involvement of the frontal lobes (93 patients), inferior temporal-occipital region (55 patients), and cerebellum (41 patients [unilateral in 7, bilateral in 34]). Vasogenic edema of the frontal lobe typically seemed to be linear along the superior frontal sulcus. A 21-year-old woman with SLE, lupus nephritis, and difficult-to-control hypertension presented with headache and change in vision progressing to generalized seizure. Blood pressure at toxicity was 213/167 mm Hg. A–D, Brain MR imaging (FLAIR sequence) obtained the day of the toxic event demonstrates extensive holohemispheric pattern with vasogenic edema at the junction between the medial hemispheric (ACA, PCA) and lateral hemispheric (MCA) branches. The pattern outlines the entire supratentorial watershed or borderzone in the frontal (arrows), parietal (curved arrows), occipital (open arrows), and temporal lobes (arrowheads). Vasogenic edema in the frontal lobes extends to the frontal pole region. Diffusion-weighted sequence demonstrated no restricted diffusion. E, Postcontrast T1-weighted MR image demonstrating prominent cortex and adjacent subcortical white matter edema (arrows) with focal sulcal compression and distortion. Atypical lesion locations were also identified with a greater-than-expected degree of frequency. Involvement of the brain stem was present in 17 (12.5%) of 136 patients and included abnormality in the midbrain (10 patients), pons (11 patients), and medulla (2 patients) (Fig 3A). Involvement of the basal ganglia was also present in 19 (13.9%) patients and included involvement of the thalamus (12 patients, 5 bilateral; Figs 2A, 4B, and 5B) and caudate nucleus (4 patients, Fig 4C). Vasogenic edema in the deep white matter was present in 25 (18.3%) patients (Fig 4C). Involvement was typically in the corona radiata, but there was also involvement of the splenium of the corpus callosum in 13 (9.6%) patients. Atypical lesions were recognized more commonly on MR imaging studies in particular lesions in the basal ganglia and brain stem. In 4 patients, thalamic and midbrain vasogenic edema was the dominant pattern, with lesser hemispheric vasogenic edema present. A 50-year-old woman 6 months post liver transplant experienced a generalized seizure and unresponsiveness. Blood pressure at the time of the toxic event fluctuated markedly with a range between 106 and 200 mm Hg systolic and 54 and 80 mm Hg diastolic. A–E, Brain MR imaging (FLAIR sequence) obtained the day of the toxic event demonstrates moderate vasogenic edema in the subcortical white matter of the frontal (white arrows), parietal (white curved arrows), and occipital regions (white open arrows) with some cortical involvement consistent with a milder expression of the holohemispheric pattern. Thalamic involvement is present (black arrowhead, 2B) along with the upper margin of vasogenic edema present in the pons (black arrow, 2A). Acute focal parenchymal hemorrhage developed at toxicity in 11 (8%) patients (single hemorrhage, 9 patients; multiple hemorrhages, 2 patients; frontal, 3 patients; parietal, 4 patients; occipital, 4 patients; inferior temporal-occipital junction, 1 patient). In 3 patients, focal subarachnoid and sulcal increased attenuation (CT) or signal intensity abnormality (MR) was present overlying the cortex resembling focal subarachnoid blood or protein. Enhanced MR imaging studies available in 88 of 114 patients at toxicity appeared normal in 43 patients, with stippled cortical enhancement noted in 19 patients in the regions of PRES signal intensity abnormality. Prominent focal cortical hypointensity (edema) was present on the postcontrast T1 sequence in 34 patients (Fig 1E), with dominant hemispheric white matter hypointensity (edema) noted in 15 patients. Diffusion-weighted MR images available in 82 of 114 patients at toxicity demonstrated focal areas of restricted diffusion in 9 (4 with focal hemorrhage) with no restricted diffusion in 73 patients. Three primary variations of the traditional PRES imaging pattern were recognized in 99 of the 136 patients, along with incomplete expression of these PRES patterns in 37 patients. These features are summarized in Table 2 and Figs 1–6. In 31 (22.8%) of 136 patients, vasogenic edema was present in a linear pattern spanning the frontal, parietal, and occipital lobes, with lesser involvement of the temporal lobes (Fig 1). This linear vasogenic edema seemed to be present at the junction between the medial hemispheric (anterior cerebral [ACA] and posterior cerebral arteries [PCA]) and lateral hemispheric branches (middle cerebral artery [MCA]) consistent with the watershed or anastomotic border zone. Extreme and lesser degrees of holohemispheric involvement were recognized as a continuum in these 31 patients (Fig 2). Reduced involvement in the cortex or deep white matter typically appeared as nonconfluent cortical vasogenic edema, which was most commonly identified along the superior frontal sulcus or a “string-of-pearl” pattern of linearly arranged, disconnected white matter edema (Fig 2). In 37 (27.2%) of 136 patients, distinct involvement of the frontal lobe was identified and associated with varying degrees of parietal and occipital abnormality (Fig 3). The frontal abnormality appeared linear and was located along the mid to posterior aspect of the superior frontal sulcus. This was similar to the appearance in the holohemispheric watershed pattern, with more isolated superior frontal sulcal involvement and no frontal pole extension. Intermediate expression of this pattern was also noted, with either nonconfluent areas of cortical vasogenic edema along the superior frontal sulcus (Fig 4) or regions of focal or patchy white matter vasogenic edema. A 36-year-old man with severe type 1 diabetes and recurrent septic arthritis of the shoulder requiring frequent debridement presented with several days of headache, nausea, and visual changes along with hypertension. Blood pressure at toxicity was 184/111 mm Hg. A–E, Brain MR imaging (FLAIR sequence) demonstrates moderate vasogenic edema in the parietal (white curved arrows) and occipital (white open arrows) cortex and white matter with linear involvement along the superior frontal sulcus (white arrows) in the mid to posterior frontal lobes bilaterally. The extreme frontal poles seem normal (3B). This pattern is consistent with the superior frontal sulcus pattern. Cerebellar involvement (white arrowheads) is also present along with vasogenic edema at the junction of the pons and midbrain on the right (black arrowhead, 3A). A 48-year-old woman with acute myelogenous leukemia status post allogenic BMT had a seizure 19 days after transplantation. Baseline blood pressure was 134/84 mm Hg, and blood pressure at toxicity was 132/48 mm Hg. A–B, Vasogenic edema is present in the occipital poles (open arrows) and thalamus (arrowheads) bilaterally along with deep white matter in the subinsular region (small arrow). C–D, Vasogenic edema is present in the parietal region (curved arrows) and corona radiata and subinsular region (small arrows) bilaterally and caudate nucleus on the left (arrowhead). E, Vasogenic edema is present in the parietal region (curved arrows) bilaterally with involvement along the superior frontal sulcus (large arrows) bilaterally. A linear “string-of-pearl” pattern is also present in the adjacent left centrum semiovale (small arrows). MR imaging is consistent with a more diminutive expression of the superior frontal sulcus pattern. In 30 (22.1%) patients, the typical “posterior” pattern was present with involvement of the parietal and occipital cortex and white matter with variable involvement of the temporal lobes (Fig 5). Extensive as well as lesser degrees of severity of this pattern were identified. 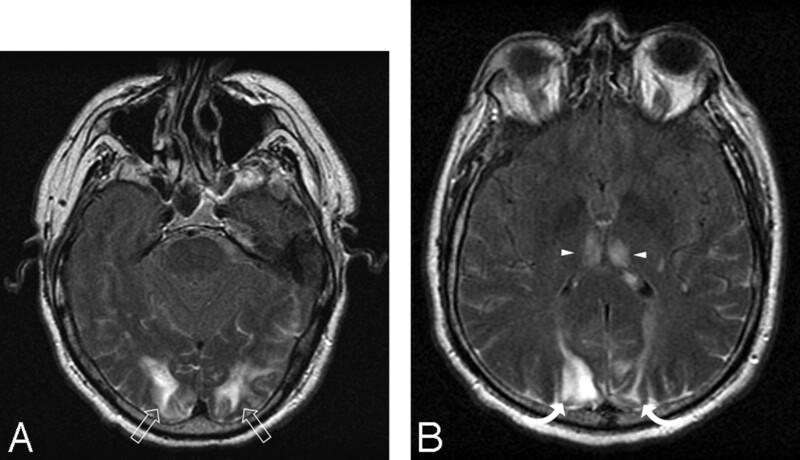 A 56-year-old diabetic man with a foot infection on antibiotic treatment experienced a headache and visual change. Baseline blood pressure was 191/88 mm Hg, and blood pressure at toxicity was 215/115 mm Hg. A–B, Brain MR imaging (FLAIR sequence) obtained at toxicity demonstrates vasogenic edema in the occipital lobes (open arrows) and parietal region (curved arrows) bilaterally as well as involvement in the cerebellum bilaterally (not shown). This is representative and typical of the dominant parietal-occipital pattern. CSF hyperintensity is noted, likely related to ongoing oxygen administration. Partial or Asymmetric Expression of the Primary Patterns. In 38 (27.9%) patients, incomplete expression of the 3 primary PRES patterns was found. These patients tended to have a lesser degree of brain involvement with PRES. The frontal lobes were frequently involved in these patients, with either a linear pattern or a patchy, disconnected linear arrangement. Partial expression of PRES (defined as the absence of signal intensity abnormality in either the parietal lobes bilaterally or the occipital lobes bilaterally) was noted in 16 patients. In these patients, one of the primary classic locations was notably without abnormality (typically the occipital lobes), with other portions of the cerebral hemispheres involved in typical locations (Fig 6). A 20-year-old woman with a high-risk pregnancy who at 32 weeks of gestation became preeclamptic. At 33 weeks of gestation, she experienced a significant headache, blurred vision, and mild hypertension (156/106 mm Hg) with fetal distress and ultimately had a generalized seizure at delivery. A–C, MR imaging demonstrates patchy vasogenic edema in the parietal region (curved arrows) bilaterally along with linear involvement along the superior frontal sulcus on the left (arrows) consistent with the findings in eclampsia. Involvement in the occipital lobe was not present, and the temporal lobes and cerebellum were normal bilaterally. Absence of occipital lobe involvement placed this in the partial and asymmetric expression group consistent with partial expression of the PRES pattern. Asymmetric expression of PRES (defined as unilateral absence of signal intensity abnormality in either the parietal or occipital lobe) was noted in 17 patients. Here again, other portions of the cerebral hemispheres were involved to varying degrees in typical locations. Partial and asymmetric expression of PRES was noted in 5 patients, with both lack of involvement in either the parietal or occipital region along with asymmetric expression of signal intensity abnormality in the involved parietal or occipital lobe. Clinical neurotoxic syndrome (headache, visual change, altered mentation, seizure or no seizure, hypertension or no hypertension) was present initially in all patients. No significant difference was noted between blood pressure at toxicity and either the clinical associations that developed PRES or the imaging patterns identified (Tables 3 and 4). In the overall study population, 7 patients died during the course of their toxic syndrome, and 50 patients had clinical improvement, but follow-up imaging was not obtained. In 79 (58%) of 136 patients, follow-up imaging was available, which demonstrated reversal (complete, 57 patients; substantial improvement, 21 patients) of the overall PRES pattern. Reversal of vasogenic edema was documented equally among all patterns: holohemispheric (20/31 patients, 64%), superior frontal sulcal (22/37 patients, 59%), dominant parietal or occipital (16/30 patients, 53%), partial expression (8/16 patients, 50%), asymmetric expression (10/17 patients, 58%), and partial and asymmetric expression (3/5 patients, 60%). Focal areas of restricted diffusion or hemorrhage typically remained as residual areas of encephalomalacia. Comparison of initial CT versus follow-up MR imaging detection of PRES at toxicity is summarized in Table 5. Overall, the initial CT study demonstrated imaging features consistent with PRES in 30 (45%) of 67 patients. In 22 (33%) of 67 patients, the initial CT study demonstrated nonspecific features, and in 15 (22%) of 67, the initial CT study was normal. In patients in whom PRES was recognized on MR imaging 1 day after or on the same day as the initial CT imaging and toxic event, the initial CT study was typically either negative or demonstrated nonspecific findings (32/48 patients, 66%). It is surprising that in patients in whom MR imaging was obtained 2 or more days after the toxic event, the initial CT study demonstrated PRES in 14 (74%) of 19 patients. In 15 of the 30 patients in whom a hemispheric PRES pattern was clearly identified on the initial CT and follow-up MR imaging study, additional regions of vasogenic edema (20 lesions) were also present in the cerebellar hemispheres, brain stem, basal ganglia, and deep white matter. In 11 regions, new lesions were seen on MR imaging: 5 in the cerebellar hemispheres, 3 in the brain stem, 1 in the basal ganglia, and 2 in the deep white matter. In 8 regions, lesions were detected on both CT and MR: 5 in the cerebellar hemispheres, 1 in the basal ganglia, and 2 in the deep white matter. In 1 region, resolution of lesions was noted on MR (deep white matter). Time to follow-up MR varied from 2 hours to 14 days (same day, 7 patients; 1 day, 9 patients; 2 or more days, 14 patients). The results in our patients demonstrated several important observations related to the imaging appearance of PRES: 1) common involvement of “atypical” brain locations other than the parietal or occipital region, 2) the presence of 3 distinct imaging patterns in PRES, and 3) common partial expression of these patterns including absent involvement in the parietal or occipital lobes. These observations are of critical importance, particularly with respect to the recognition of PRES features when neurotoxic syndrome develops. Although the parietal and occipital lobes were the most frequently abnormal regions in our patients, involvement of the frontal lobe was common (68%, in particular along the superior frontal sulcus), and vasogenic edema in the temporal lobe (40%) and cerebellar (30%) regions was not unusual. Involvement of the basal ganglia (14%), brain stem (13%), and deep white matter (18%) were less common but were confidently recognized as part of the PRES process, particularly when associated with the hemispheric features. Distinct involvement of the splenium (10%) was clearly observed. Cortical hypointensity was also a distinct observation on postcontrast T1-weighted images, with frequent accentuation of the adjacent sulcal vessel. Unusual lesion locations such as the brain stem, deep white matter, and splenium have been demonstrated previously with focal hemorrhage or subtle subarachnoid blood.1,5,18,27–30 Recognizing these “atypical” locations as part of PRES can be important, particularly if traditional expressions of patterns are incomplete. Three distinct PRES imaging patterns could be recognized in most of our patients. Dominant parietal or occipital involvement (most consistent with an isolated posterior appearance) and holohemispheric involvement were clearly different. The superior frontal sulcus pattern resembled the holohemispheric pattern but with incomplete involvement along the anterior aspect of the superior frontal sulcus, which suggested incomplete expression of the holohemispheric distribution. When extensive vasogenic edema was present, severe but distinct forms of these 3 imaging patterns could be recognized, without development of a continuum. Recognizing these intrinsic patterns may aid the observer to identify PRES, particularly if the pattern is diminutive. Vasogenic edema that is typically seen linearly along the superior frontal sulcus seems to define the junction between the anterior cerebral territory and middle cerebral territory, which suggests a distribution between the medial (ACA, PCA) and lateral cerebral branches (MCA). Linearly arranged focal vasogenic edema or a “string-of-pearl” appearance in the centrum semiovale (Figs 2 and 4E) could represent involvement of the deep white matter watershed, because this pattern has been described in hemispheric borderzone infarction.31 If PRES vasogenic edema is related to hypoperfusion, typically observed parietal or occipital involvement could simply represent expected expression in the most distal and, presumably, most vulnerable watershed region.19–21 Isolated edema in the superior frontal sulcus could reflect reduced perfusion between the distributions of the distal ACA and MCA, and involvement or extension of the process to the anterior frontal lobes could suggest more perfusion defect in the proximal ACA or MCA. In 28% of our patients, incomplete or asymmetric expression of one of the 3 primary PRES patterns was noted. This observation has further implications related to the detection of PRES. Vasogenic edema was absent in the parietal or occipital lobes bilaterally (12%) or unilaterally (12%) in a several patients with PRES, with frequent abnormalities present in the frontal lobes along the superior frontal sulcus. It may be important to consider PRES when confronted with a complex imaging pattern in which portions of the typical PRES appearance is noted but the complete pattern is not present, or a substantial portion of the abnormality lacks restricted diffusion. Focal edema in the cortex and sulcal vessel noted on postcontrast T1 could assist with pattern recognition. Partial or asymmetric PRES patterns could also have implications related to the mechanism behind the development of vasogenic edema in PRES. It is certain that vasospasm and decreased perfusion have each been recognized in PRES.5,7,9,18–21 Variable expression of the PRES patterns could be related to differences in arterial anatomy, preexisting vascular disease in the face of altered brain perfusion, or regional hemispheric involvement in the underlying clinical toxic process. Despite severe clinical symptoms, initial imaging in PRES may be normal, and the pattern clearly develops with time.5 As highlighted in the CT and MR comparison data (Table 5), although the PRES pattern could be identified by CT, the initial finding on CT was frequently normal or nonspecific, with confirmation more secure on follow-up MR imaging. In addition, subtle or atypical lesions may be missed in patients who undergo CT imaging only. Whether the improved MR recognition is related to increased sensitivity or time delay is uncertain. It is unclear why a subset of patients had early recognition of PRES by CT with MR obtained 2 or more days after initial imaging, though the patient's clinical condition at toxicity may have played a role. Three distinct imaging patterns could be recognized in PRES (holohemispheric, superior frontal sulcal, and dominant parietal-occipital), with frequent partial or asymmetric expression of these patterns observed. Involvement of nonposterior portions of the cerebral hemispheres (frontal and temporal lobes) and cerebellum were frequent. Involvement in the brain stem, basal ganglia, deep white matter, and splenium were not uncommon. Partial or asymmetric PRES was more frequently recognized in patients with eclampsia and solid organ transplantation, possibly related to more suspicion in these clinical settings. Partial and asymmetric PRES was infrequently noted in patients with infection, sepsis, and shock, possibly related to differences in pattern recognition or mechanism. Awareness of this variability in patterns is important in proper recognition of PRES, when present. Accepted after revision November 24, 2006. Posterior reversible encephalopathy syndrome in an HIV-infected patient on antiretroviral treatment: what is the risk factor? Controversy of posterior reversible encephalopathy syndrome: what have we learnt in the last 20 years?